We got used to it, as I am a native Aussie speaker, and Ben is learning the language, even adopting key phrases such as ‘on the mend’, and ‘have a think’. And even though she was an Aussie in a strange land, she pronounced all the names of towns correctly, and knew that ‘Yosemite’ does not rhyme with ‘Vegemite’, even though it looks like it should. “Yoi-se-mitt-ee,” she declared boldly – and correctly. It was because she had done so well for 4 of the 5 days we were travelling, that her first and only slip up stuck out like dogs balls. 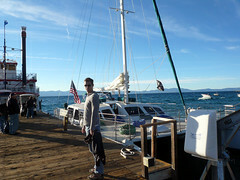 Lake Tahoe, is pronounced with a long soft ‘Tahhhh’, followed by a rounded ‘ho’. Imagine our amusement then, when Kylie announced that we were turn left onto ‘Lake Ta-ho Drive.’ Her version of the lake rhymed with ‘Cat-hoe’. I suppressed a giggle, because I didn’t want to embarrass her. But every time she said it – and she said it a lot, considering we were there for two days – the giggles started to escape. Poor misguided Kylie; someone should have told her. I just didn’t want it to be me. But you say Ta-ho, I say tomah-to. Regardless, it is a stunning place to visit. It IS touristy, there is no denying that. The shorelines are lined with places to stay, from 5 star resorts to cheap and cheerful motels. And every fast food restaurant chain on the planet is represented at least once. The southern end is a hub of activity and the invisible line between Nevada and California is clearly visible in South Tahoe. The casinos blink and dance along the main drag, and then noticeably stop. I am sure if we’d been walking we could identify the line in the sidewalk, and stand with one foot in each state. The northern end of the lake is a little more subdued, with more wildlife visible from the main highway, and more residences than the south. The western road between the two winds up into a mountain range, and curls past small lakes. At one point in the drive on the second day, we drove along a mountain ridge, with a drop on either side of the road. 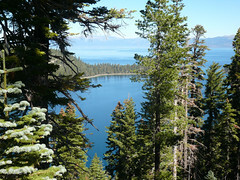 South of us was Cascade Lake, and north of the road, was Emerald Bay on Lake Tahoe. “Every mountain road should be like this,” declared an impressed Ben. “You should always be able to drive on the ridges.” Magic. Our visit fell in the shoulder season between summer sailing and on-the-lake fun, and winter skiing and snowboarding. The locals were storing their quad bikes and jet-skis, and dusting off the snowmobiles. As I mentioned in a previous blog, road-works were in abundance. It was as though the precious few weeks between the summer and winter seasons was the only time that the work could be done. “Quick! The skiers will be here any second now!” Tahoe had more people in hard hats than in sun hats. Worse still,the signs said to expect delays of up to 30 minutes. Fortuitously, we never waited that long, but I felt for locals. They can sigh with relief as the tourists disappear, only to then get stuck in traffic. We had other things on our mind, however. We had come to eat, see, do and enjoy. Our first night was at a Marriott resort, where we happily handed our car over to valets, and availed ourselves of the pool. The weather was unseasonably warm, so to throw on my bikini when I was expecting to be wearing jeans and a sweater, was a welcome surprise. Ben got into the pool, and taunted me until I joined him. I am an ‘inch by inch’ girl when it comes to getting in a pool. On a very hot day I will dive in, BUT that day was just ‘warm’. I went with the inching, and then we frolicked a bit, as we do when in the pool together. G-rated, of course. There were children present. We had armed ourselves with brochures, which we looked through as we dried off on our loungers. We were keen on some sort of sailing excursion, and thought of riding the Zipline at the top of the mountain, but the gondolas to get up the mountain weren’t running the next day. Quad biking! We could go on a quad bike ride, an activity I loved so much in New Zealand last year, I described it as the most fun I had ever had outside. It was getting on the afternoon, and I really wanted a cocktail. That meant it was time to get dressed in proper clothes and seek out some fun. We got recommendations for two restaurants, both ‘beachside’, and decided to head to the furthest one. The temperature had dropped quite a bit by the time we got there, so I was a little dubious about the offer to sit outside until I saw the outdoor heaters. Sitting practically underneath one, I was toasty warm. It was 10 minutes before the end of ‘happy hour’ so we asked to see the cocktail menu. They didn’t have one, and if we wanted happy hour cocktails, we had to go inside to the bar. No problem. Only when we got to the bar, happy hour cocktails were beer and an alcoholic slushy. Hmmm. We went back outside, sat at our warm table, and asked for the wine list. Things improved vastly. The wine recommended (an Aussie red) was delicious, and so was the food. 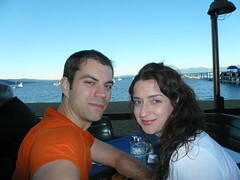 Best of all, though, was the sunset over the water, for which we had a ‘ring-side’ seat. Spectacular. Without the warmth of the heater, the cold bit into us as we raced back to the car. We decided to stop for more wine, and this was when we became a trio. Next door to the liquor store was a place that sold alpacas (not the actual animals, but stuff made out of their hides). And there amongst the strings of white alpaca bears suspended from the ceiling, was a little dark grey bear. His face was quite extraordinary, and I knew at once that he had to come with us. His name is Tahoe – original, I know. That night, while I conducted my ablutions, Tahoe got up to all sorts of mischief. 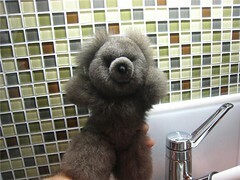 He is a very naughty bear, with a wild and crazy Afro. The next day was the day for quad-biking and a sunset cruise on the lake. Only I took one look at my outdoorsy clothes and hiking boots, and had another idea. I broached it before breakfast. “Um, I had a thought.” Ben looked at me, curiously. “Yes?” “How about you go quad-biking, and I stay here and go to the spa?” I tried to sell it with my best smile. He looked crest-fallen. “But you love quad-biking. It was your idea.” I knew that. And I knew that if I went it would be fun, but I sooooo wanted to just relax and be a girl that day. We went for breakfast, and came back to our plans on a full stomach. Ben would wait by the pool with a book while I had my girlie spa fun, and then we would drive to the quad biking. I would then go check in at our cabin, and come back for him. Then we would go on the yacht for the sunset cruise. The day went to plan, and the drive to the quad bike trail was beautiful. It was there that we rode the crest of that peak, and saw Emerald Bay and Crystal Lake. I dropped him off and headed north. I had Kylie to guide me, even though it was only one turn at a major intersection and impossible to get lost. I pulled up outside “Rustic Cottages”, and it was my turn to be crest fallen. I thought back to our beautiful little rustic cottage in Hokitika, New Zealand. This place fell short – very short – think Danny DeVito. I checked in, and went to our cottage. It was so small inside that there was literally 18 inches between the bed and the walls. I could hear traffic from the highway, which wasn’t surprising considering it was 12 feet away. I showered, and grabbed a change of clothes for Ben, in case he was covered head to toe in mud when I collected him. When I walked out to the car I noticed a semi-circle of Adirondack chairs facing the highway. I looked at what would be the view from the chairs: a hotel across the road, and glimpses (I mean specks) of Lake Tahoe water. Sigh. I stopped for water and snacks, for the ride between the quad bike trail and where we were going was an hour, and my man had been doing manly things. He would need sustenance. I pulled up at the trail, and there he was, cleaner than I thought, but with the smile I knew would be on his face. “Hi, Babe,” he said leaning over to kiss me hello. “Have fun?” “Yeah,” but then he added, “It would have been more fun if you’d been there.” Point taken. I felt a twinge of disappointment in myself, and for him, but I also felt relaxed – and clean – which I liked. I shook the conflicted feelings while Ben told me about his adventure. We decided on a late lunch/early dinner at the second restaurant recommended the previous day. It was a good call. 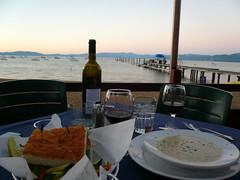 The view was not as nice as the night before, but the food was even better. Fish tacos take on a whole new meaning when they are served on a soft tortilla, and the fish is spiced just so. Delicious! We wanted to be sure to get to the pier on time, so made our way with Kylie in charge. 15 minutes later we were there with an hour to kill. 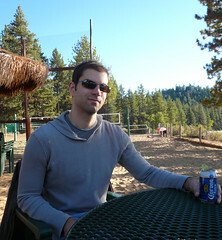 Ben ordered a Corona from the bar – in a can, but still served with lime – and we alternated between watching beach volleyballers and their dogs, and two ‘tweenies’ swimming in their jeans while their grandmother tried to call them out of the water. More enticing, however, was the view. The sun was low in the sky, and waves lapped gently at the grey beach. “Want to go for a walk?” We walked away from the pier, and Ben tossed sticks to two volleyballer’s dogs. I leaped up onto a big rock plonked in the middle of the beach, and tipped my head to the sun. Nice. With an eye on the time, we wandered back towards the pier, where a crew member introduced himself, the captain and importantly the bartender. He made a few lame jokes about life jackets and then we could get on board. There were bean bags on the deck, and a few people opted for these prime spots. 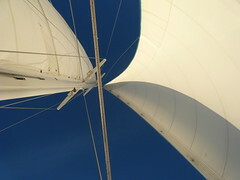 I headed to the back of the boat, and as we pulled away from shore, the wind started to whip through my hair. Ahhh. It felt so good to get out on the water again. It always did. And because Ben and I met on a yacht, any chance we have to sail, we love. It reminds us of a Grecian summer two years ago when our lives changed. We eventually moved forward to the front of the boat, where it was colder, but the view was more magnificent. Large splashes of water came on board soaking a few railing-huggers and their cameras. But we stayed close to the cabin, and snuggled into a beanbag and under a blanket. We sipped our cheap champagne from plastic cups, and munched on pretzels. The sun sank behind the mountains we had driven through – twice – earlier that day, forming a ragged silhouette against a dark blue sky. Planets popped out first, and then the stars. We could hear wind in the sails, and the crash of the hull against the water as it pitched and fell. Tipsy from the champagne, we spent time just listening and looking, and then one would quietly say something to make the other laugh. It was heaven. As we headed back to shore a couple of hours later, I noticed that my hands were numb. Ben went below for hot chocolate, which is my favourite drink when I am cold. We stayed on deck a while longer and then waited out the rest of the trip below deck. People still queued at the bar for drinks as well pulled up at the dock – they were included in the price, and I guess they wanted to make the most of it – but we were sated. It was a chilly walk back to the car, where Tahoe waited patiently. What a wonderful day it had been. I did, however, forewarn Ben about the ‘cottage’. We had a bit of a laugh as we tried to maneuver around each other, eventually deciding that the traffic in the room was better if we both just stayed in bed. 7 hours, a ticking heater, traffic noises, and an intrusive street lamp later, I awoke feeling less than rested, and completely over our rustic experience. I finished packing as Ben went to settle up. “Uh, he’s got a whole breakfast happening over there.” I looked up from the bags. “He’s making waffles and everything. It’s included.” Homemade waffles! Suddenly, I loved “Rustic Cottages”. We made our way over to the dining room, where we got to make our waffles fresh. I ate two whole waffles, knowing that the sweet sticky goodness would backfire on me later in the day, and not caring. YUM! Tahoe rode up front with me as we made our way back to lovely Reno (ah-hem). 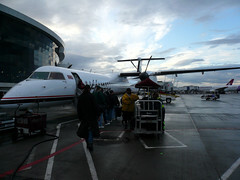 The tiny prop plane that had brought us was there at the gate, waiting to take us home. I had more faith in it than the first time I had seen it five days before. “I have been on buses bigger than this plane,” I said before we got on. The engines whined loudly as it took off, as though it was trying with all its might to get off the ground. I ignored it, and played my favourite video game on Ben’s I-pod. Snow was expected in Tahoe the next day, but that didn’t concern us. We were heading home. Ah yes, I remember now – the Rubicon Trail. I think we liked that because we liked the Rubicon winery in the Napa Valley.